In May 2002, Father Viorel Tencaliuc, with the blessing of Deputy Archbishop of the Orthodox Church in America and Canada Iosif and with a small group of Romanian Orthodox Christians, establishes a new mission in Toronto, Ontario by the name of “St. Dumitru Romanian Orthodox Church”. The legal name of the Corporation is “St. Dumitru Romanian Orthodox Church”, which is referred hereinafter as the “Parish”. Incorporated on May 14, 2002 as a not-for-profit organization and registered charity, the Parish was amalgamated with Sts. 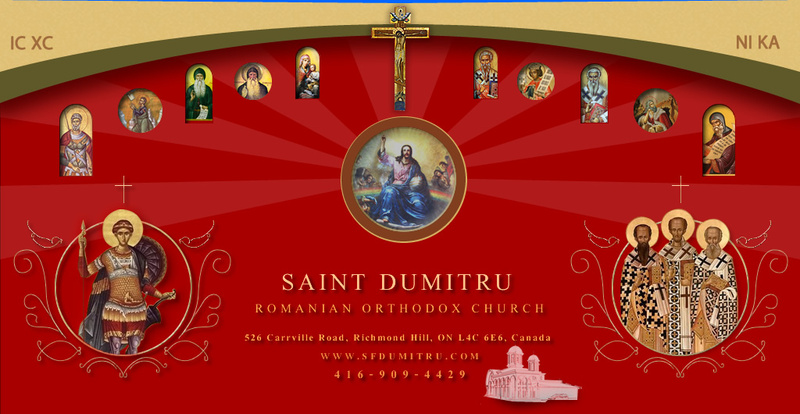 Three Hierarchs Mission in Toronto Romanian Orthodox Church on April 23, 2007, continuing to operate under the name of St. Dumitru Romanian Orthodox Church. The Head Office of the Parish is located at 526 Carrville Road, Richmond Hill, Ontario, L4C 6E6, Canada. The Parish, as the local Eucharistic community of St. Dumitru Romanian Orthodox Church, is organized under the jurisdiction of the Romanian Orthodox Archdiocese in the Americas, whose ecclesiastical authority is its canonically consecrated Hierarch, His Eminence Archbishop Nicolae Condrea. In order to be aided in his leadership activities, the Archbishop appointed His Grace, Vicar Bishop Ioan Casian of Vicina, as Auxiliary Bishop, who enjoys the right to be honored according to his rank. Both the Archbishop and the Auxiliary Bishop are members of the Holy Synod of the Romanian Orthodox Church. The Parish conducts its activities according to the Statutes for the Organization of the Romanian Orthodox Archdiocese in the Americas. These Statutes went into full effect on February 13, 2007 having been adopted by the Archdiocesan Congress of the Romanian Orthodox Archdiocese in the Americas held in Chicago, Illinois on July 1, 2006, and approved by the Holy Synod at its session of February 13, 2007.